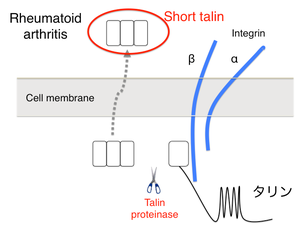 We discovered that talin was cleaved into short-form, short talin, by a proteinase (tentative name: talin proteinase) in the peripheral blood lymphocyte from rheumatoid arthritis (RA) patients. Also this short-talin is expressed specifically in RA patinets and could be useful for the diagnosis and monitoring for RA (The patent being applied). 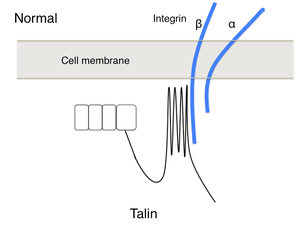 Talin has been known as a cytoskeletal protein, which, by binding to integrin β subunit, enhances the inside-out signaling from intracellular to extracellular of integrins, cell adhesion, cell migration, and causes chronic inflammation and angiogenesis. In RA patients, activated lymphocytes have been known to infiltrate into the extravascular region and cause chronic inflammation, a variety with a focus on synovial lymphocytes infiltration. Although anti-CCP antibody and the rheumatoid factor are used for the diagnosis of rheumatoid arthritis, the sensitivity of the anti-CCP antibody and the specificity of the rheumatoid factor are low. 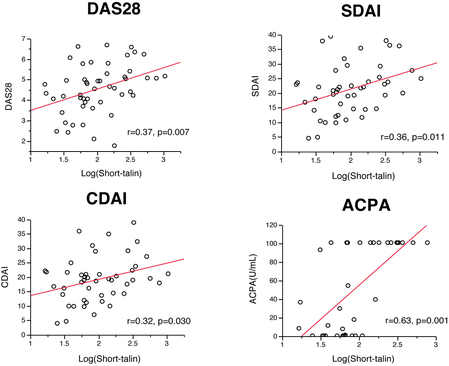 Moreover, these conservative diagnostic factors are sometimes negative in the early-stage of rheumatoid arthritis. 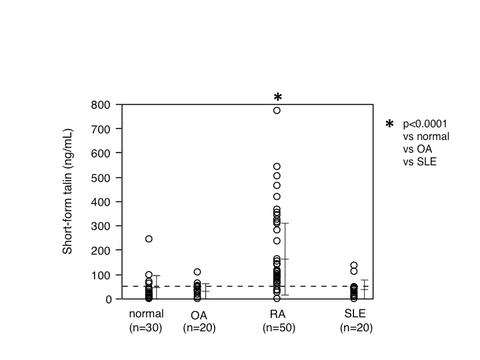 The brand new biomarker, short talin, is positive even in such an early-stage rheumatoid arthritis and we can diagnose RA with much more sensitivity and specificity. 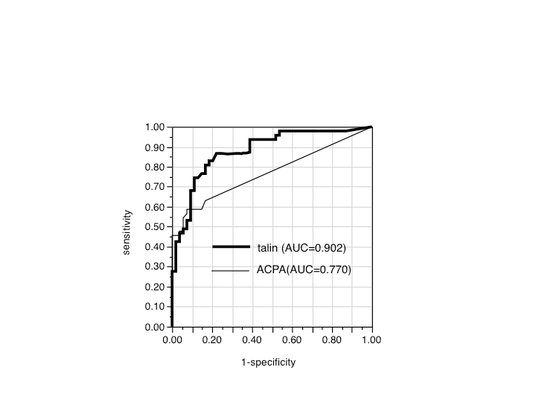 ﻿DAS28, SDAI, CDAI, and ACPA were significantly co-related with the plasma short-talin.